Two murder cases with international significance will prove a test for the governments of Thailand and the Philippines. The murder of two young British tourists in southern Thailand and the killing of a Filipina transgender person in the Philippines, allegedly by a American soldier, have created a political mess for both countries. The governments of Thailand and the Philippines are under pressure to quickly solve the cases, which could both affect their bilateral relations with the United Kingdom and United States. The prime suspect in the killing of Jeffrey “Jennifer” Laude, whose lifeless body was found in a motel near a former American military base in the Philippines, is U.S. Marine Private First Class Joseph Scott Pemberton. Laude’s death, allegedly at the hands of an American soldier, has revived the clamor to review existing military agreements that allow U.S. troops to visit and build temporary facilities in the Philippines. Pemberton’s unit is briefly stationed in the country to participate in military war games. The Philippines used to host two American bases in Clark and Olongapo, but these were removed after the Senate rejected the bases treaty in 1991. U.S. troops were able return to the Philippines through the Visiting Forces Agreement (VFA), which was ratified in 1999. In April this year the Enhanced Defense Cooperation Agreement (EDCA) was signed during Obama’s visit to the Philippines. It legalizes the building of semi-permanent U.S. military facilities in various parts of the country. Negotiations for the EDCA implementation were about to start when the Laude murder hit the news. Activist groups immediately called for the rejection of the EDCA, VFA, and other purportedly one-sided agreements that trump Philippine sovereignty. They argued that the inability of the Philippine government to gain full custody over Pemberton is a concrete example of the unfair provisions in the signed military agreements. Senator Miriam Santiago also renewed her demand for the scrapping of the VFA. Another debate ignited by the Laude case is the discrimination or marginalization suffered by the LGBT community in the country. Laude has become a symbol for LGBT groups demanding gender equality, protection, and fair treatment. Meanwhile, in Thailand, the deaths of British backpackers Hannah Witheridge and David Miller in Koh Tao island beach resort has greatly embarrassed the military-backed government. The police is accused of bungling the investigation after failing to apprehend suspects and file appropriate charges in the court. They eventually presented some Burmese migrant workers who “confessed” to committing the crime. But the suspects have now recanted and claimed that they were tortured into producing a false confession. It didn’t help that the prime minister advised foreign tourists not to wear bikinis in order to be safe, implying that victims of crimes are to be blamed for their ordeal. He has since apologized for making this remark on national TV and insisted that he was only thinking of the safety of visitors. 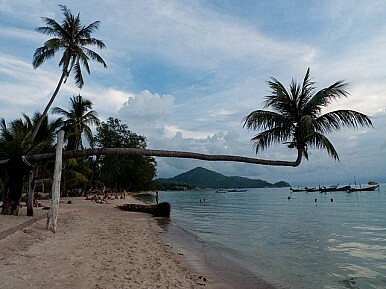 The murder case in a popular destination has badly affected the tourism sector, which has yet to bounce back from the setback it received when the Thai military grabbed power in a coup. The political instability created by the coup and the unsolved murder case involving British tourists will make it all the harder for Thailand to entice tourists to return. In the Philippines, a foreigner is accused of committing murder; while in Thailand, two foreigners were allegedly murdered by migrant workers. In both cases, the crime of murder has produced political problems with national and international repercussions. The local population are shocked, enraged, and closely monitoring the two cases. The international community, meanwhile, is observing how the respective justice systems handle the cases. Ultimately, it is the governments of Thailand and the Philippines that are under trial.